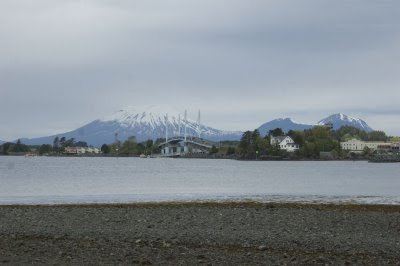 As we sailed into Sitka, it became very obvious how beautiful the area surrounding this city is. 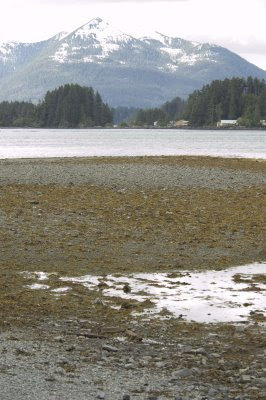 Sitka Sound, the body of water that Sitka sits directly on, is covered with small rocky islands with many pine trees on them. Most are uninhabited but a few have huge, beautiful homes on them that can only be reached by boat. It must be quite a place to live. This was also the first stop at which we had to have a tender to get to land. 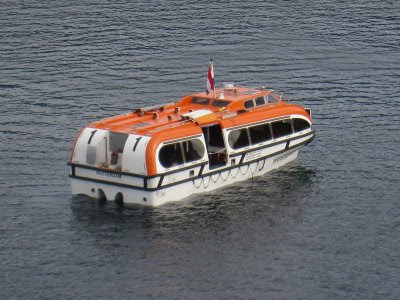 Tender is when the cruise ship cannot get right up to the docks and must anchor out in the bay and therefore you must ride smaller boats up to the dock. This is one of the many tender boats that were running back and forth to the cruise ship all day. After getting off the tender, I immediately noticed a shorebird working its way along some rocky coastline. I was able to quickly relocate the bird and identify it as my lifer Wandering Tattler. It was exciting to start the day off with such a great bird! 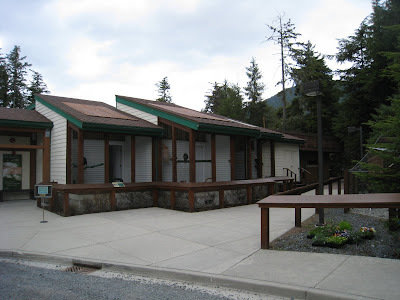 We then quickly headed off to Sitka National Historic Park or Totem Park. 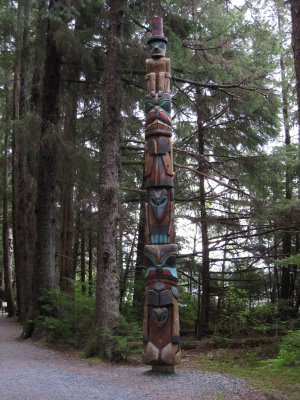 This park has many totem poles and magnificent views of the sound in addition to numerous bird species. The pine trees at this park are so dense that it is extremely difficult to find the birds even when you can hear them. Needless to say, knowing the bird's songs was very important in this park. When I would hear something that was new for me, I would have to spend a considerable amount of time finding the individual that was singing. 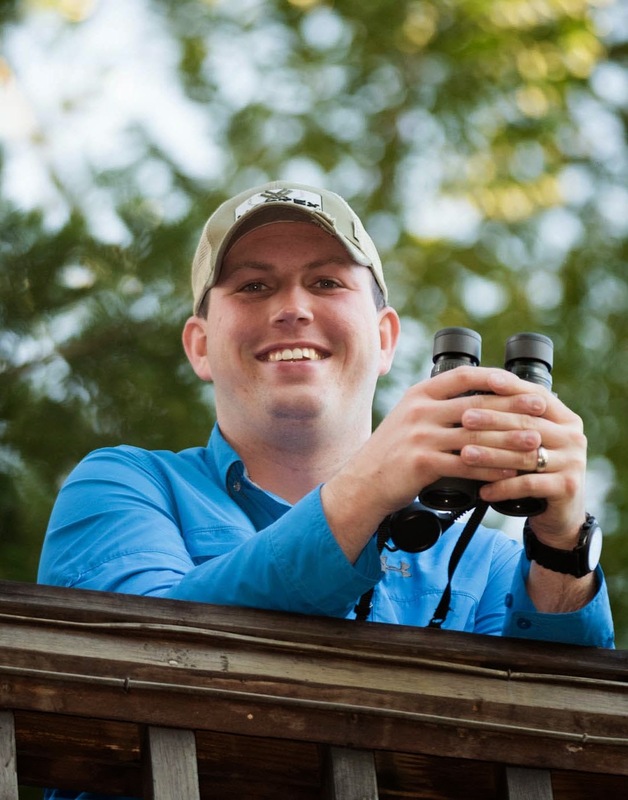 I was rewarded for my efforts with a wonderful look at a Chestnut-backed Chickadee. The rocky shores in the park were also productive. I found Harlequin Duck, Whimbrel, Long-billed Dowitcher, and a juvenile Glaucous-winged Gull. The following five pictures were all taken within the park. 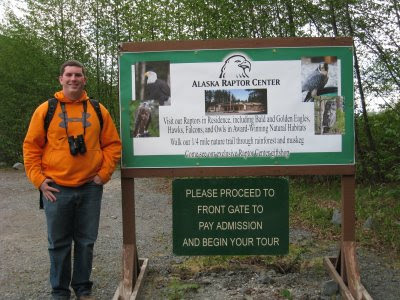 After birding in Totem Park, we headed over to check out the Alaska Raptor Center. 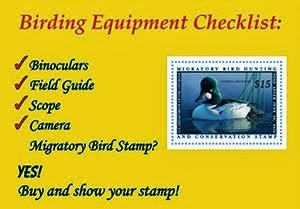 This place is really amazing and their work has saved hundreds if not thousands of raptors over the years. Please watch for a follow up post to learn more about the center and how you can donate to help them continue to serve injured raptors throughout Alaska. Be sure to check back and continue to follow my awesome trip to Alaska! Check out more great Watery Wednesday posts here! Did you get any other pics at the raptor center? Great shots from up north, thanks for sharing. Beautiful images. You looked like you had a great time there. OMG! !I sooo want to visit Alaska some day.And you have reinforced that feeling.Love the pictures. Your photos are totally awesome, Rob. Thanks for the journey, I enjoyed it. wow it's cool, I like it. Beautiful photos. 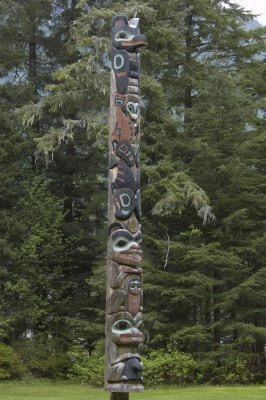 I love those totem poles. 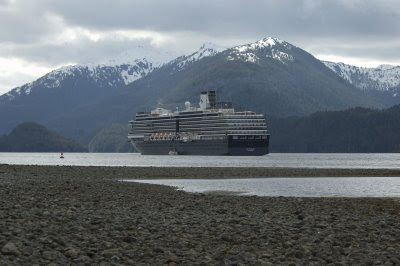 Thanks for sharing your Alaskan cruise. Beautiful post. Excellent shots. Thanks for sharing. Love the water shots with the snowcapped mountains..
What a fun cruise ! 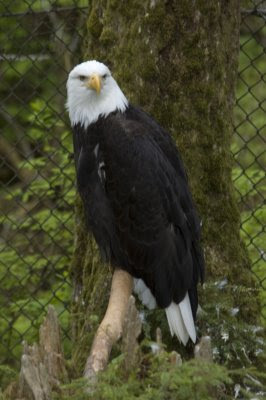 The Norfolk Botanical Garden here in Virginia has a nesting pair of bald eagles. They have built nests in the high pines and have raised two or three chicks a year for over five years. This year there are three and no drama. Last year there was a problem with an interloper female and a bit of a Peyton Place set up. Only one chick survived and had some medical problems. The cruise ship looks hug from that perspective. You obviously had a whale of a time!